FOR IMMEDIATE RELEASE—March 25, 2013—ANN ARBOR, MI—Logic Solutions and Larky, a venture-backed startup rooted in Ann Arbor, announce the updated Larky mobile app and website. The Larky app for iPhone can be downloaded today from the App Store. Larky helps consumers get more from their memberships and loyalty programs by alerting them when they are eligible for savings and discounts because of these affiliations. Users can also browse through the perks that they are entitled to in the app and on the website. Larky helps consumers get what they deserve by keeping tabs on the countless discounts and benefits entailed by their membership affiliations. Millions of Americans belong to organizations and institutions ranging from health insurance and credit card companies to alumni associations and museums. However, membership perks are seldom used to their full advantage, because consumers tend to misunderstand or forget about their benefits. Getting started with Larky is free, fun and intuitive, and it requires no passwords or member numbers. In the app, Larky users identify their affiliations with groups such as Alumni Associations, Community & Social Welfare, Credit Cards & Financial, Entertainment, Food, Beverage, Retail, Health Insurance, Travel, and more. This information creates a personalized perks dashboard that displays a user’s active perks and discounts. Larky draws on real-time membership data to categorize these benefits based on location and merchant type, and alerts users when a benefit is immediately available. Larky is the brainchild of Co-Founders Hammerman and Andrew Bank, local entrepreneurs who founded the company in 2012 and have received funding from North Coast Technology Investors, The Michigan Pre-Seed Capital Fund, Invest Detroit’s First Step Fund, and several Angel investors. Larky is designed for anyone who has ever bought something and later realized they could have paid less by using member discounts or perks they forgot they had. 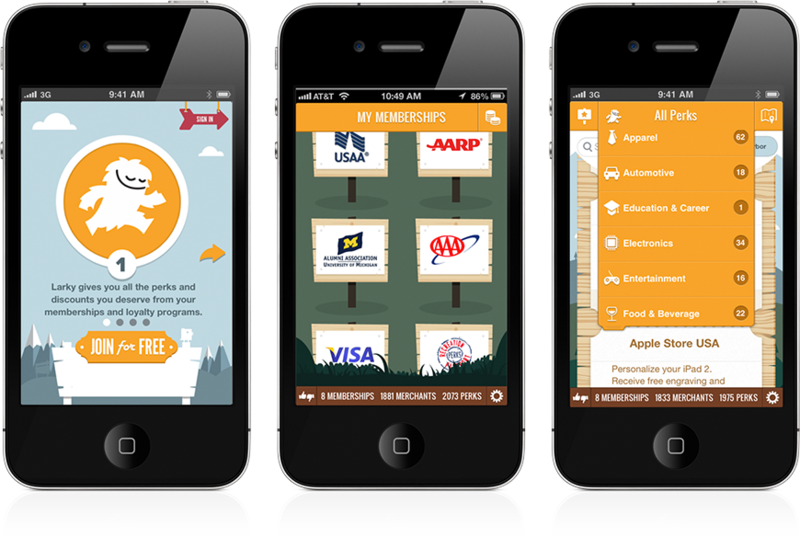 Larky helps consumers get all the perks they deserve from association memberships and loyalty programs. Larky sends reminders at the right time and place so members don’t miss a thing. It’s serendipitous delight. And it’s free. Find out more at www.larky.com.